Whales fill us with hope. If something so big can flourish here, maybe in time the smaller and less obvious parts of the puzzle can too. This quote is taken from a recent article in the Vancouver Sun. The article focuses on the surprising resurgence of marine mammals in the Salish Sea. 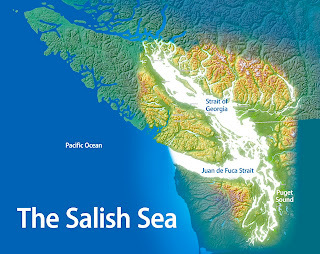 The Salish Sea is a 7,000 square kilometer body of water that includes the Juan de Fuca Strait, the Strait of Georgia and Puget Sound. Within this territory is a complicated ecosystem that has seen a considerable amount of damage since the arrival of European settlers. Overfishing, commercial whaling, pollution, habitat destruction and climate change have all affected the region. Concern for the marine mammals in this area began nearly 50 years ago when scientists started tracking and recording the dramatic dips in population. When the alarms sounded, measures were set in place to increase the numbers by limiting and in some cases banning commercial hunts. Management of fish stocks, in regards to whale population, became important. Habitats were protected and pulp and paper mills that bordered endangered marine habitats were shutdown. Marine life became a major concern for not only the scientists working on the West Coast, but also the residents living here. And now for the good news. Since the 1960s, the population of harbour seals, which once numbered as low as 15,000, is now over 100,00. The number of humpback whale sightings is up. The stellar sea lion population is thriving. 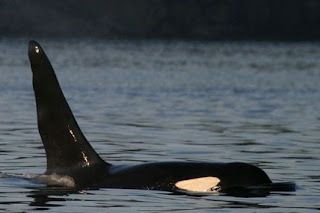 And while the number of resident killer whales is down to 88 in the Salish Sea, the number of transient killer whales passing through our waters is up dramatically. An increase in large mammal numbers means the smaller marine animals, further down the food chain, are increasing as well. There are still 113 species of marine organisms that are threatened in the Salish Sea, but the increase in the larger mammals gives us hope. Interesting Fact: It takes 660 chinook a day to feed the resident killer whales in the Salish Sea. Feathercract. Made in Canada. Paddled Worldwide.